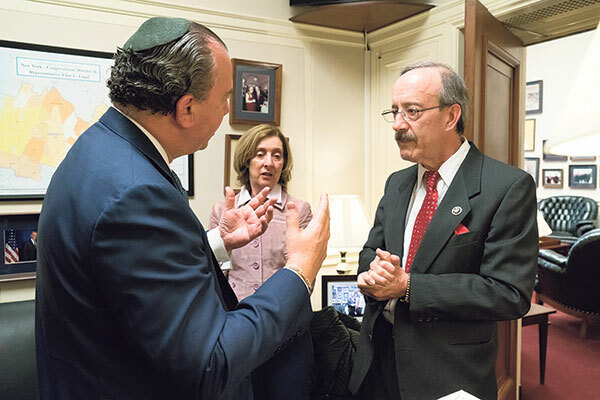 FFEU president Rabbi Marc Schneier, left, and Sheryl Olitzky of the Sisterhood of Salaam/Shalom meet with Rep. Eliot Engel (D-NY, Dist. 16). MORE THAN 100 Muslim and Jewish leaders and interfaith activists came together in Washington, DC, on March 16 for the Foundation for Ethnic Understanding’s celebration of the Republic of Azerbaijan. Among them were Sheryl Olitzky of North Brunswick, cofounder and executive director of Sisterhood of Salaam/Shalom, and Walter Ruby, FFEU’s director of Muslim-Jewish relations, director of its NJ region, and founder of its NJ Muslim-Jewish Solidarity Committee. 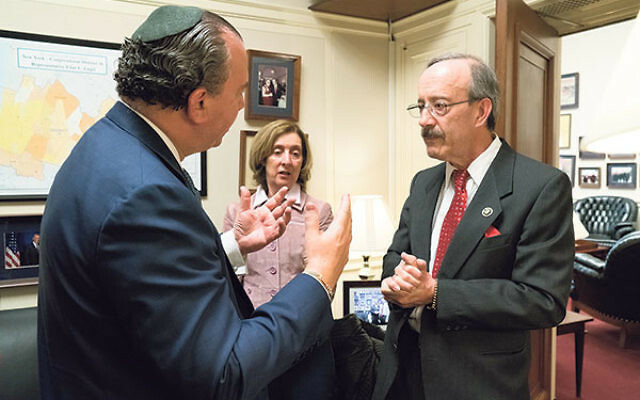 The visit was the first-ever joint American Muslim-Jewish mission to Capitol Hill focused on expressing support for a foreign country because of its commitment to promoting interfaith dialogue and religious diversity. The group was welcomed by Azerbaijan’s ambassador to the United States, Elin Suleymanov. The country was praised for its contributions to enhancing Muslim-Jewish relations and for modeling how a predominantly Muslim country can protect the right to freedom of religion for citizens of all faith backgrounds. Among the delegates were FFEU president Rabbi Marc Schneier; Dr. Sayyid Syeed, national director of the Islamic Society of North America; Mohammed Elsanousi, director of external relations, Network of Religious and Traditional Peacemakers and Washington representative of Finn Church Aid; and Dr. Marshall Breger, professor of law at Catholic University of America and liaison to the Jewish community during the Reagan administration. Schneier, who met with Azeri President Ilham Aliyev in the capital of Baku in April 2015, spoke of the country “as the paradigm of Muslim-Jewish coexistence in the Islamic world” and expressed his gratitude to the government for its warm relationship with Israel and support of the two-state solution to the Israeli-Palestinian conflict. Syeed recalled visiting Soviet Azerbaijan in the 1980s and spoke of his horror at seeing so many beautiful mosques that had been allowed to fall into disrepair or turned into Communist Party offices. “Today it is wonderful to see an ambassador from a former Soviet, now independent, state like Azerbaijan who can say with pride that he is a Muslim and that Islam is one of the main features of that country,” said Syeed. He also praised Azerbaijan for upholding the religious freedom of all its citizens and working to strengthen relations between Shia and Sunni Muslims. The delegation also visited with House members to express their support and gratitude to Azerbaijan for its efforts to strengthen Muslim-Jewish relations in the Middle East and worldwide and its close cooperation with the United States on counter-terrorism efforts.